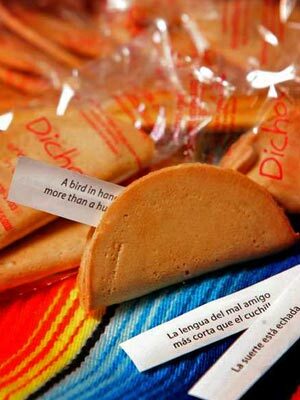 The Los Angeles Times food section did a recent piece on taco-shaped fortune cookies. Dichos, as the cookies are called, have been appearing at restaurants — Mexican and others — in southern Arizona in a haphazard pattern in which word-of-mouth has far outpaced formal distribution. Raul and Marina MontaÃ±o, the Douglas, Ariz., couple who came up with the idea after a Chinese meal in March 2007, have been fielding calls for their product since they opened for business just over four months ago. The machine they describe actually sounds just like the fortune cookie machines, made by Yong Lee, outside Boston (thought they don’t mention him by name).